Posted by Jonny Greenwood on 4/12/2019 8:47:25 AM. Nowadays, we are living in a world on the go, people have been used to handle all kinds of jobs with laptops, cellphones, and tablets. Kindle Fire, a super nova in the gadget world, is certainly showed up in many people's hands, we use it to listen to music and podcast, watch movies and TV Shows, read all the classic public domains and best sellers, we even use it to check emails and process business documents. As to process business documents, we always need to print them out. But it seems impossible to achieve this goal with Kindle Fire because it doesn't offer any "print" function and we can't plug it to a printer either. Therefore this guide post is born as the times require. You can learn more than one way for printing Kindle Fire via a wireless printer and other magic tricks. Google Cloud Print is the most convenient way to do this trick, because you don't need a wireless printer but just a regular printer installed on a PC which has been connected to Google Cloud Print center. And there are many third-party apps on Kindle Fire that can help you easily connect your Kindle Fire to GCP, in this post I will recommend you some ones. BTW, if you are not using Kindle Fire but other Android tablets or cellphone, this guide also suits you well. After making your printer Cloud Ready, now let's do some tricks on your Kindle Fire. For printing documents from Kindle Fire I recommend you install an app called "Easy Print" which is free in Amazon App Store. After installation, open the app, you will see the interface as the screen shot on right side. First you need to login with your Google account, then click "Print Document", find the document you want to print, you can also choose multi files for one time, then click "Print". In fact, the way it works is that the documents you chose will be emailed to a server and transfer the order to the PC you have connected with the cloud ready printer, then the printer receives the order and prints the documents out. For printing web pages, I recommend you another app "PrinterShare", it is also available in Amazon AppStore and Google Play and it cost $12.95. Open the built-in web browser app in your Kindle Fire, go the page you want to print, click "Share" in the bottom menu, then choose "Share via Printer Share ", you will be lead to the PrinterShare app. You can have some customize settings in the app, such as zoom in & zoom out the page to adjust the part you want to print, etc. After finishing the settings, you can choose your printer and paper size then print the web page out. For Kindle Fire users, you can print emails out exactly as print webpages because you can login your email box in web browser. And if you are not willing to login your email in web browser but used to check them in apps, PrinterShare is also your best choice. Open the app, you will see the Gmail tab as the left image shows, then you can choose the emails and print them out. Notice: This app can't grab Google account information in native Kindle Fire system(Amazon has wiped out Google's elements in Kindle Fire). If you have rooted your Kindle Fire and installed the native Google Android system, you may have this function working well. Or you have to go to the web browser to print them out. You can also use this app to print pictures, events on your Google Calendar, web pages, Google Docs and documents. The only drawback of this app is that it cooperates closely with Google services, if you are using other emails, you have to login in the web browser then print the webpage. In fact, the method to print from Nexus 7 or other Android tablets is exactly the same with print from Kindle Fire as they are all Android-based devices. For your better reading, we've compiled a slide for you. If you mean printing Kindle books out to paper, please read this post. If your printer has a wireless or bluetooth feature, your work will be much easier. There will be no need to connect your computer with Google Cloud Print, just install the apps in the list above, then click print and choose your wireless/bluetooth printer, your files in Kindle Fire will be printed out quickly and easily. And notice, your Kindle Fire and the printer should be in the same WiFi environment. Does this post solve your problem? If yes, please spend 1 second to click "+1" buttons below and let your friends see you've worked out this magic printing job. And we really appreciate if you can leave your feedback in comment. I have a wireless printer and my Kindle Fire will not find it... any suggestions. It says I do not have a default printer. 1. Is your printer and your KF in the same WiFi network? 2. 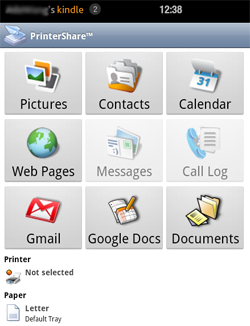 Has you installed the print-assistant app on your KF? Read this article on printing from the Kindle Fire. With that, someone made the following comment "I have a wireless printer and my Kindle Fire will not find it... any suggestions. It says I do not have a default printer." Very informative. Just the info I needed. Thanks! Only problem is Kindle doesn't support google android apps. Still no printing. That's why this post title is "print from Kindle Fire". I download both apps and much to my surprise every thing worked fabulously. I have 2wireless printers. The apps found both of them and I was able to print from the web and email without any issues from my kindle fire. FANTASTIC!!! !